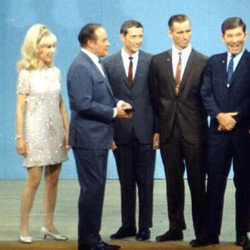 The 1960s were characterised by a variety of highly diverse clothing styles and trends. Fashion in the 1960s was a major departure from the fashion traditions of the first half of the 20th century, especially after the mid-1960s. The decade’s fashion trends, however, also had a major influence on later styles including those of the 21st century. The early 1960s women’s style of clothing was inspired greatly by fashionable yet highly elegant celebrities including the US First Lady Jackie Kennedy who popularised the pillbox hat. Women in the early 1960s also wore shifts – geometric dresses, short jackets with large buttons, while full-grown dresses were favoured for evening wear. Capri trousers were the preferred casual wear. In 1964, the British fashion designer Mary Quant introduced the miniskirt that soon became a favourite among women throughout the western world. In the same year, Andre Courreges launched the so-called space look that was adopted by many women as well. A typical space look consisted of trouser suit or short box-shaped dress, both of which were worn with white boots and goggles. The mid-1960s saw the introduction of bell-bottomed trousers which replaced Capri trousers as the preferred causal wear by the late 1960s when many young women also adopted the hippie style that dominated the last years of the decade. Accessories lost their prior importance in the 1960s. Hairstyles varied greatly from very short cuts to beehive hairstyles which eventually gave way to strait long hair that was popularised by hippies. Men in the early 1960s followed either the London Modernists (the Mods) or the Rockers. While the latter wore black leather jackets and pompadour wet hairstyles, the Mods followed fashion trends from France and Italy and favoured classy tailored suits which were often worn with anoraks. Unlike the Rockers who rode motorbikes, the Mods rode Vespas. Many young men in Britain as well as elsewhere in the Western world were influenced greatly by The Beatles. The so-called Beatle haircut or mop-top was imitated throughout the world. Since The Beatles followed the Mod style in their early years, they also helped popularise the style. However, they were not particularly popular among the ones who identified themselves as the Mods. Just like women’s fashion, men’s fashion also became influenced greatly by the hippie look in the late 1960s. Men began to wear bell-bottomed trousers and jeans, tie-dyed T-shirts and headbands. Hats practically disappeared, while many men began to wear long hair by the end of the decade. Also popular were longer sideburns, moustaches and in the late 1960s, full-grown beards.